Addoley Dzegede: Ballast, installation view, Contemporary Art Museum St. Louis, May 11–August 19, 2018. Photo: Dusty Kessler. Jacob Stanley: TIME, installation view, Contemporary Art Museum St. Louis, May 11–August 19, 2018. Photo: Dusty Kessler. Sarah Paulsen: The Invention of Whiteness, installation view, Contemporary Art Museum St. Louis, May 11–August 19, 2018. Photo: Dusty Kessler. CAM presents the eighth edition of the Great Rivers Biennial featuring new work by St. Louis-based artists Addoley Dzegede, Sarah Paulsen, and Jacob Stanley. The artists work in varied media, with their project proposals involving textiles, animation, and sculpture, respectively. The award winners were chosen by a distinguished panel of jurors following individual studio visits of ten semi-finalists. More than 150 artists applied for the Great Rivers Biennial Arts Award Program, a collaborative initiative between CAM and Gateway Foundation designed to recognize artistic talent in the greater St. Louis metro area. Generously funded by Gateway Foundation, the program awards each artist with $20,000 and a major exhibition in CAM’s galleries, on view May 11 through August 19, 2018. Jacob Stanley says his sculptures live in a “dynamic stasis—a state between collapse and construction, tension and balance, refinement and rawness.” For the Great Rivers Biennial he plans on making a series of machines that explore the nature of labor and how we define work in the 21st century. The 2018 Great Rivers Biennial is organized for the Contemporary Art Museum St. Louis by Wassan Al-Khudhairi, Chief Curator. 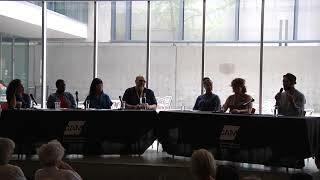 The Artist and Juror Panel Discussion is generously supported by the Robert Lehman Foundation.